Condominiums come in all shapes & sizes, ranging from small low-rise with about 40 units to huge high-rise blocks with over a thousand units. Most condos are a secured development with leisure facilities, which can include Pool, Gym, Tennis Courts, Squash Courts, Mini-Mart and more. As these developments offer an "All in One" concept this makes it a popular choice for expatriates. Condominiums come in varying number of bedrooms & living area sizes depending on the development from a small cozy Studio (Approx 500SqFt) to a large luxurious Penthouse (Approx 3000SqFt Plus). Whilst newer and more modern condo's may cost more and are generally easier to maintain, older condo's tend to be bigger in size. If you enjoy your space, older units will suit you well. Apartments are similar to condominiums but don't have any facilities like swimming pools, tennis, squash courts & BBQ pits - however some have security and a car parking option. 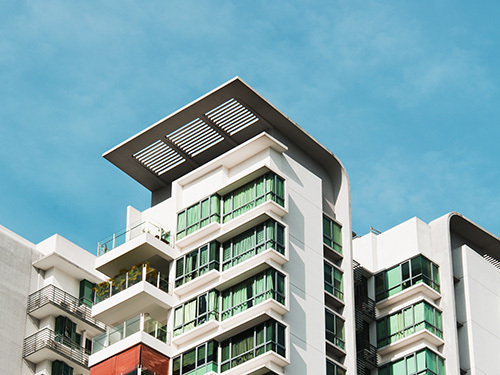 Apartments can be found all around Singapore from a stand-alone small development to an apartment block situated above a shopping mall or an office building. Semi-detached (Semi-D) are a pair of houses attached together by one common wall. Some of them have an Al-fresco patio area, car porch and a small garden area. Some have a small in-ground or Lap pool and are normally two or three storeys high. Inter terrace houses are a row of houses that are sandwiched in between two other neighbours. Most have a small car porch and/or grass or concrete garden at the front and a small washing area at the back. Corner terraces are at the end of the Inter terrace rows and normally have a slightly bigger garden area and possibly a Patio. Bungalows & detached houses come in all different shapes & sizes being either the modern 2-3 storeys or the older single storey Colonial style. A lot of these types of houses in certain areas boast large garden areas with lush greenery and most come with large private In-ground pools. Cluster houses are a small handful of bungalows, houses or semi-d's with their own small garden area, situated within a small private compound which normally has a shared pool & security gate. Townhouses are similar to cluster housing but tend to be inter terrace or corner terrace type houses situated on a larger private development with facilities like common pool, gym, tennis & security guardhouse. Some developments also have high-rise condominium style apartment blocks also sharing the same facilities. Conservation houses or sometimes known as Peranakan style shop houses, like the black & white houses, were commonly occupied by lower ranking British officers during the British Empire ruling. Most of them have wooden flooring & stairs with natural daylight skylights allowing sunlight to filter in from the courtyard. Most of theses houses come in 2,3 or 4 levels with some boasting balconies or a small roof terrace and a Koi pond or water feature. Black & white or colonial houses are the old style traditional renovated buildings that were commonly occupied by high-ranking officers during the British Empire ruling. Most black & whites traditional are white in colour with black wooden beam supports & high ceilings. Most of them have huge gardens with separate quarters for maids or servants. There are a large number of these grouped around Singapore, but they can be hard to acquire, particularly as there is a waiting list for these properties.